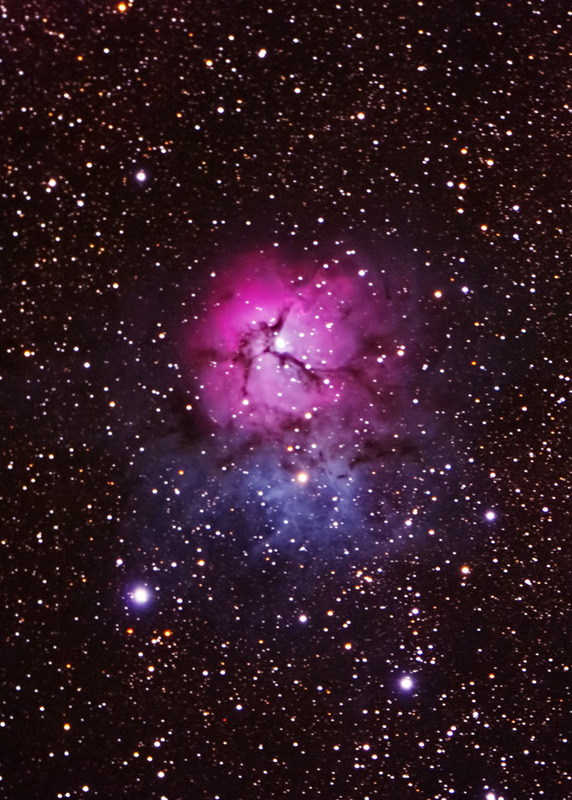 Due to its distinct dust lanes (separately known as Barnard 85), M 20 it is commonly known as the Trifid Nebula. That is, it is "divided into three lobes." This object is unique in that it consists of a combination of open star cluster, emission nebula, and reflection nebula. Lying near the heart of the Milky Way in the constellation of Sagittarius, its estmated distance is somewhere between 2200 and 7600 light years. It was catalogued by Charles Messier in 1764. Exposures: 24 @ 5 min. Camera was focused using a Bahtinov mask with live view. Subframes were aligned and combined in ImagesPlus. The combined image was adjusted in Photoshop; some cropping was applied. Topaz Detail and DeNoise were used to sharpen the image and reduce noise. Taken from my front yard in southeaster Minnesota on 8/7/16.